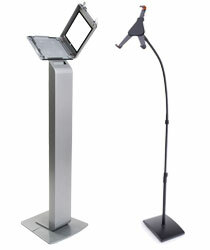 Can any business or organization use commercial iPad fixtures to increase engagement? Absolutely. Retail stores, manufacturing facilities, hospitality industry vendors, schools, and professional environments all incorporate tablets and mobile devices into their everyday operations. Our commercial iPad fixtures are designed to keep handhelds and touchscreens highly visibile without sacrificing security. Different mounting and installation styles accommodate a huge range of use, from manufacturing to hospitals to trade shows to direct customer sales and classrooms. Professional grade commercial iPad fixtures, sometimes called mobile device display accessories, are invaluable to today's engaged shoppers, clients, and students. 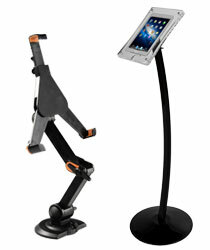 Businesses across every industry use these accessories and displays as part of their every day operating tools. What are the different types of mobile device display accessories? Commercial iPad fixtures for countertop tablet use range from employee workstations to customer checkout fixtures to shared information stations. Enclosure styles offer tilt, rotation, flip function, and can either block or allow access to Home Button functions. Case locks, permanent bolt-on base styles, and portable clamp mounts accommodate professional needs in offices, retail stores, trade shows and events, classrooms, and conference facilities. 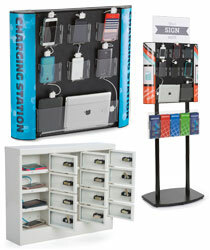 Freestanding mobile device display accessories are designed to withstand public use in high traffic areas. Sturdy locking tablet cases protect valuable equipment, while user-friendly features encourage customers to engage with digital content. 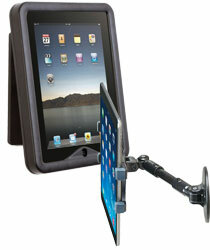 Lightweight, portable styles allow iPad fixtures for sales and marketing to be placed for maximum visibility. Fixed, permanently installed floor stands are ideal for wayfinding, informational, and shared use in lobbies, check-in areas, sales kiosks and more. 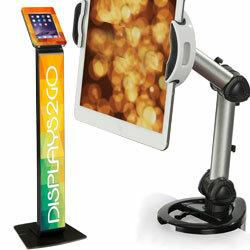 Wall-mounted mobile device display accessories are ideal for high traffic business environments. These fixed-mount installations combine the ease of access of an interactive station with the visibility of a digital signage installation. These iPad fixtures are ideal for use in manufacturing environments, hospitals, hotels, and professional business establishments. 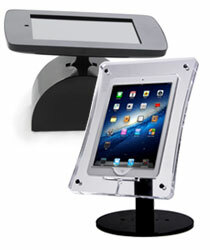 iPad fixtures with built in device charging or storage are becoming increasingly popular in professional environments. Styles range from basic recharge stations for staff and students to high visibility branded power kiosks designed to attract customers in shared or public locations. 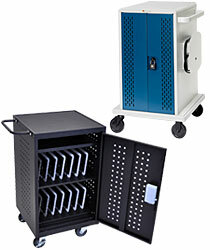 Professional-quality multi-tablet charger carts and lockers are an invaluable accessory for schools, retail stores, or any location that utilizes tablets or other handheld devices on a day-to-day basis. Interactive content for sales, marketing, information, customer self-service, and staff use is used in every industry. Our professional-grade tablet display accessories accommodate multiple device sizes and formats, from the earliest generations of Apple iPads to Air, Mini, and Android tablets. Professional, commercial, institutional, educational, industrial and even personal uses are easily supported when the right accessories are used. Our huge selection spans the wide variety of available options, from the most secure floor stand to the most portable handheld case.